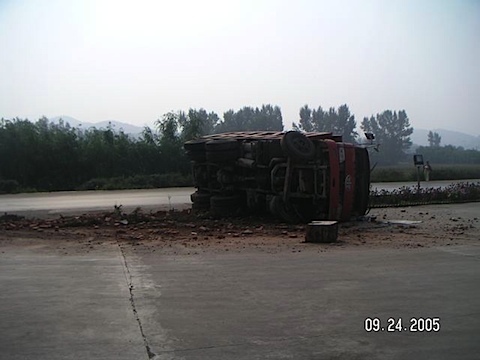 One of the most challenging aspect of working in China is traffic hazards. When I traveled by car around Guangzhou in early 1990s, I saw on average one serious accident a day. For example, a van speeding on a highway suddenly tumbled and cart-wheeled; a large truck’s entire undercarriage fell off with the upper parts of the truck sitting on the road 20 feet in front of it; a bicyclist was crushed by a truck while attempting to travel on a highway bridge; and two trucks had a head-on collision and flew 10 feet into the air like toys. 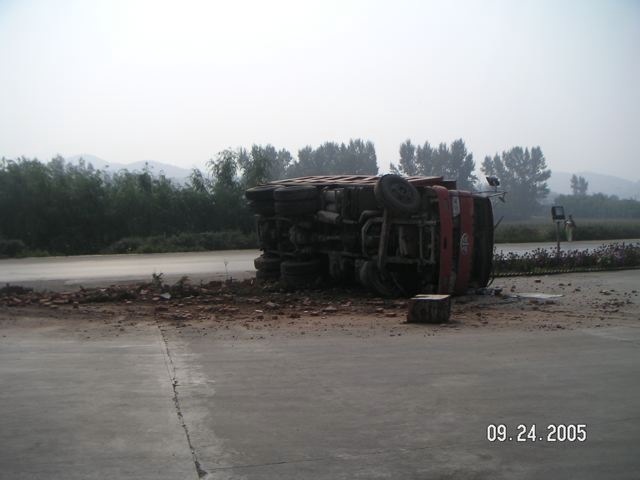 I count my blessings that Sally and I did not get into any traffic accident in China. And as a general manager of operations for a multinational corporation in China, I was relieved that none of my team suffered any injury during my watch. This is too common a sight in China. 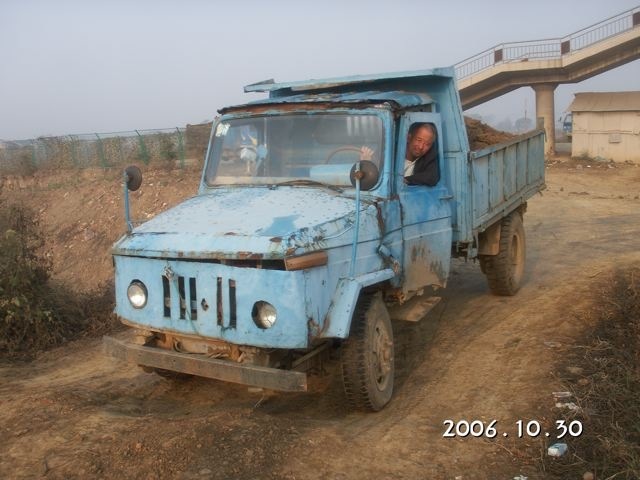 One reason for the high accident rate in China is the poor condition of its overworked vehicles. This bus had lost most of the instruments and controls on its dashboard. Some vehicles are literally held together with bailing wire. This truck worked in a private compound and did not need a license plate. I did not know if I should admire the ingenuity and tenacity of the maintenance crew or the reckless courage of the driver. A major reason for the high accident rate is the careless and sometimes reckless habits of the drivers. They would speed, cross double yellow lines, pass on the wrong side, cut lanes with inches to spare, and take unnecessary chances. 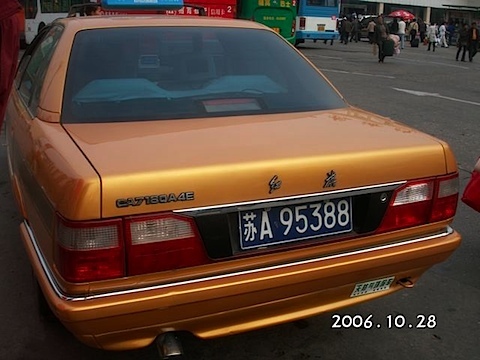 One habit of taxi drivers in Chinese cities was incessant blowing of their horns. One time, my taxi driver got onto a highway and continued to blow his horn. As we were the only car on the highway, I asked why he blew his horn. He laughed and said he did not realize he was doing it by habit. China imposed stiff fines for blowing horns and some drivers removed their car’s horns since they could not keep their hands from the horn button. 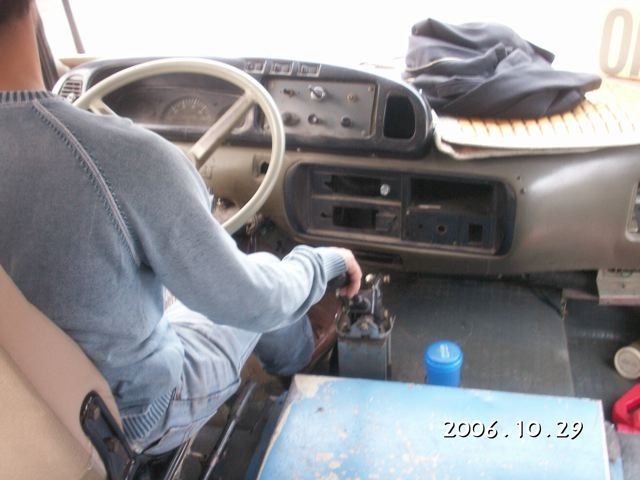 I rode on a mountain road bus in Taiwan and the driver took chances I would not have taken. The driver of this Taiwan taxi claimed he could not drive without watching TV on his dashboard. He claimed he did not have to keep his eyes on the road and that peripheral vision was all he needed. I nearly kissed the sidewalk when I got off his taxi in one piece. Chinese are progressing from bicycles to motorized bikes. In a city, I counted 1/3 of the two wheelers were regular bicycles, 1/3 were electrical motor assisted bikes or electric “Vespas”, and 1/3 were regular gasoline powered motorcycles. The electrical bicycles are sold for just a few hundred US dollars and cause little air pollution. But many riders ride them like bicycles and often ignore motorized vehicle rules. I jumped a few times when fast electric bikes sneaked up on me. 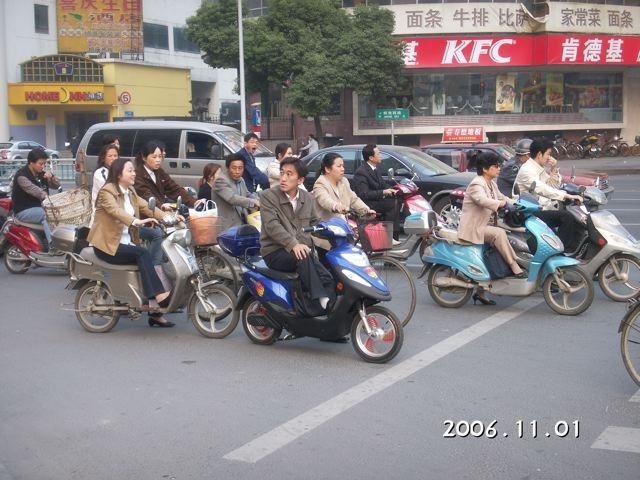 Guangzhou recently made an edict that all electric bikes are banned from the city due to their high accident rates. One owner who had both her electric bikes confiscated are suing the city to rescind this rule. Even Toyota adapted and added SCT6700RZB53L to its Coaster EX name, and Mazda added HMC6432 to its Premacy DX 1.8 name. China’s flagship manufacturer, Red Flag, has the CA7180A4E. 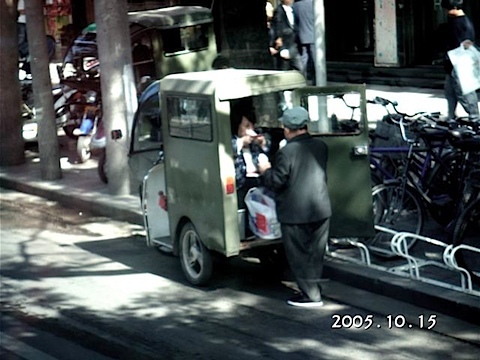 Chinese government allows disabled people to use motorized tricycles for mobility. Some of these vehicles have an additional seat and become money making tools for their disabled owners. The elderly man behind this motorized tricycle was not making money with his vehicle. He was carrying his wife who apparently was more disabled than him. He was caught by my camera in a tender moment of caring for and feeding his wife. Posted by Robert Wu on Friday, December 22, 2006, at 11:24 pm. Filed under Uncategorized. Follow any responses to this post with its comments RSS feed. You can post a comment or trackback from your blog.